People always go crazy over finding doppelgangers, now when it is about acknowledging the doppelgangers of our favorite actors, fans will absolutely go berserk over the thing. Earlier, there are many situations when doppelgangers of skipper Virat Kohli, Saif Ali Khan, and Shah Rukh Khan were found and their photographs went viral on social media. Now, Bollywood’s pretty actress Katrina Kaif’s doppelganger was found at the IIFA event and the video of her is going viral on social media platforms. As it is pretty well known that the event that took place in New York city was telecasted live. This most unusual happening left the viewers a bit confused. 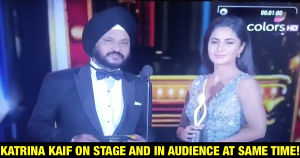 In the video, one can see Katrina Kaif on the stage during the award ceremony, next to it when the camera is panned, we can see another Katrina sitting in the audience, now, this presence of her at the two different places at one time is definitely shocking for everyone. There is only one possibility for this, Katrina must have a twin sister and she might have brought her along with her to the prestigious IIFA event at New York. This gorgeous diva garbed in an embellished gray gown was called on-stage to present the Best Actor Award to Shahid Kapoor for his spectacular performance in ‘Udta Punjab.’ And at this time, the actress was busy making the huge announcement of the Best Actor Award, the cameras panned at Shahid Kapoor, and whoa! We see birthday girl Katrina seated right beside Shahid. Coming to the facts, we can actually understand the rush of awards being aired live, and even in that live feature, there is a certain amount of editing. But an error of such heights should be crosschecked more often to avoid such mistakes.